To make the perfect waterless wash – just add water. The beauty of a waterless wash is that it is incredibly fast and you don't have to deal with a bucket and hose. You can wash your car on your lunch break if you want. It will take you five minutes and your vehicle will look like you spent all morning detailing it. McKee's 37 Waterless Wash On The Go Concentrate makes over eight 32 oz. 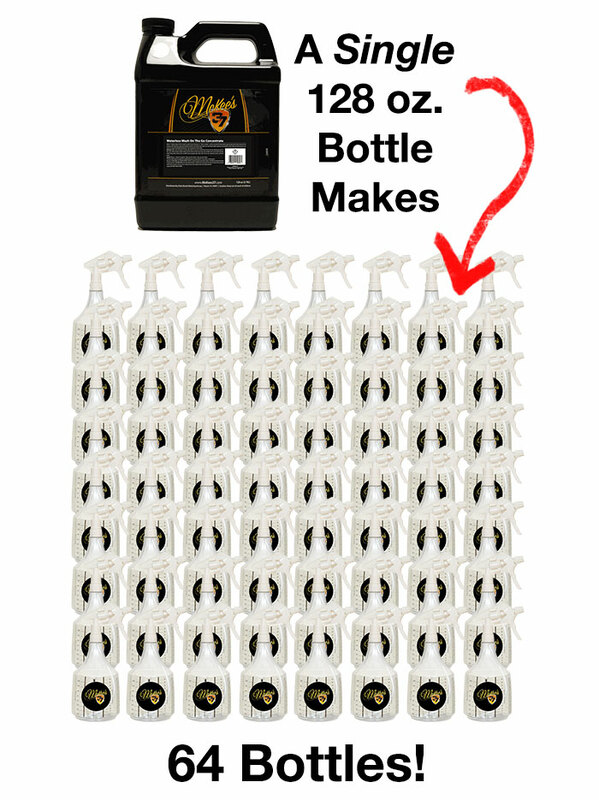 spray bottles of waterless wash (per a 1:16 dilution ratio). Application requires only a microfiber towel. You can wash your vehicle any time, anywhere! McKee's 37 Waterless Wash On The Go Concentrate lifts contaminants - such as dirt, grease, oil, and bird droppings - off the vehicle’s exterior just like a regular car wash. The high lubricity formula is packed with surface-protecting polymers to prevent scratching. When used with a plush microfiber towel, McKee's 37 Waterless Wash On The Go Concentrate is a safe, fast, and effective way to regain a just-washed shine. McKee's 37 Waterless Wash On The Go Concentrate does more than wash your vehicle – it leaves a clear coating of protection! The polymers bond to the vehicle to enhance cleaned surfaces. The coating is crystal clear and barely perceptible, except you’ll notice a richer finish. Use McKee's 37 Waterless Wash On The Go Concentrate on paint, glass, plastics, XPEL films, and metal. Use it on the wheels, tires, and exterior rubber trim, too. There’s no waterless wash as versatile as McKee's 37 Waterless Wash On The Go Concentrate! Use it inside the vehicle to clean and protect dashboards, door panels, vinyl, and plastics. It dries clear and clean to the touch, and it will not attract dust. McKee's 37 Waterless Wash On The Go Concentrate is the perfect solution to washing your vehicle when time is limited or when the weather is not working in your favor. It’s also an excellent product for a professional detailer to use to give a vehicle a final wipe- down before returning it to a customer. The blend of cleaning agents and lubricants will allow you to safely wash your vehicle without water! Use McKee's 37 Waterless Wash On The Go Concentrate to make your detailing dollar go further while maintaining a spotless vehicle. Dilute 1 part McKee's 37 Waterless Wash On The Go Concentrate with 16 parts water. Pour the mixture into a spray bottle. Spray and wipe to clean surfaces. Use a plush microfiber towel, such as the Deluxe Jr. 600 Microfiber Towel to absorb dirt. Flip the towel often. On glass, less McKee's 37 Waterless Wash On The Go is needed. Use a clean towel and just one or two sprays of McKee's 37 Waterless Wash On The Go Concentrate.